The skincare industry is oversaturated with luxury brands claiming to work miracles on the skin via extensive product lines. Skincare formulations in these lines are regularly filled with an excessive amount of inessential (and questionably toxic) ingredients. Large advertising budgets have allowed these age-old brands to continue to market these products to consumers as life-changing skincare essentials – however studies over the past decade have indicted that they are far from what we commonly define as luxury. 1) Clinical Efficacy: This the most important factor to consider – does the product actually deliver the results it claims to provide? What studies and/or empirical evidence are readily available to back up these claims? 2) Product Formulation: Even if a product is objectively effective, is the overall formulation clean? I define a ‘clean’ formulation as one that is free of parabens, synthetic dyes/colorants, phthalates, sulfates, PEGs, triclosan, formaldehyde/formaldehyde-releasing ingredients, TEA/DEA/MEA, hydroquinone, synthetic fragrances, and anything used to offset and/or “fool” the consumer into not realizing a product has gone rancid/oxidized. Clean product formulations are essential for consumers that regularly use cosmetics and skincare to prevent long-term complications instigated by the routine application of products with problematic ingredients. *Note: The above list is a reduced version of ingredients questionably viewed as toxic and/or problematic. For more information on the safety hazards of a specific ingredient, visit ewg.org for more information. 3) Brand Transparency: Many brands resort to heavy marketing and advertising campaigns to convince consumers they need products that they actually do not need. I believe a product should speak for itself. When a brand’s product is strong on its own, less of a budget is needed for marketing tactics – allowing for greater focus on R&D and overall product quality. Brands should disclose a full list of ingredients for all of their products, and justify why products are formulated in the manner that they are (i.e. if a product contains preservatives, there should be an explanation for why they are in there, and how they effect the overall integrity of the product). 4) Packaging & Delivery System: Aesthetically beautiful packaging oftentimes is what compels a consumer to pick the product up off the shelf. Over the past decade, eco-friendly packaging (i.e. 100% BPA free post-consumer recycled plastic, 100% recycled glass, and/or 100% recyclable paper using biodegradable soy ink) has become increasingly important for luxury beauty brands to utilize. Furthermore, an airless pump product delivery system that ensures the integrity of the product (by decreasing the oxidation of active ingredients and combatting bacteria proliferation) is essential to consider when choosing natural luxury skincare products with little or no added preservatives. Luzern Laboratories produces an innovative and forward-thinking line that lives up to all four of the above listed benchmarks – making it one of my newest endorsed brands. Formulated via clean/cold processing with standardized cosmeceutical, medical-grade, and bio-Suisse certified organic actives, this line goes to great lengths to ensure product efficacy, long-term use safety, and overall product integrity. All of Luzern’s ingredients (including the minimal preservatives used to inhibit bacteria proliferation and extend product shelf life) have a low hazard rating of 0-2 – rendering this brand of superior quality and fundamentally free of toxins and irritants. Products are guaranteed to last for up to 12 months when stored properly. 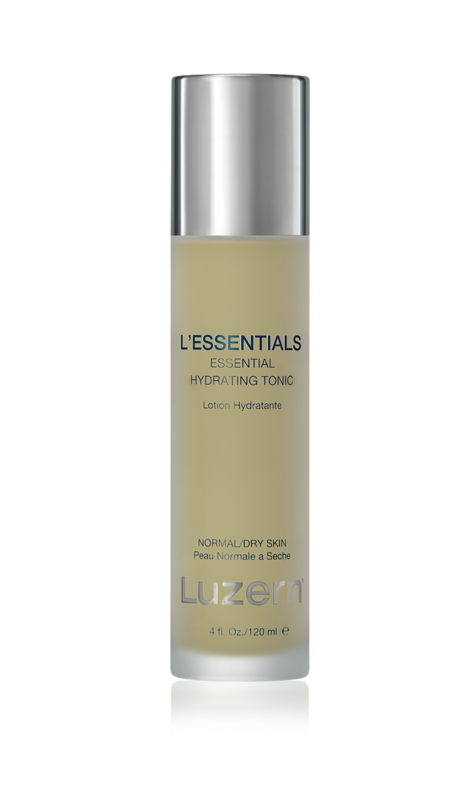 1) L’ESSENTIALS Hydrating Tonic: Formulated with aloe, willow bark, green tea, mallow flower, thyme, and echinacea flower extract, this botanically infused alcohol-free toner hydrates and refreshes the skin while boosting ceramide levels. Certified organic essential oils (rose hip seed, sweet orange peel, and lavender) produce a tranquility-inducing aroma prior the applying serums and moisturizers. For added gentle exfoliation, apply by saturating a cotton pad and sweeping it across the face (and neck) from the center moving outward. I use this product after cleansing, and before using a botanically based organic face mist. *Note: This product contains polysorbate-20 – a surfactant/emulsifier found in many personal care products. This ingredient has a low overall hazard concern, however has been flagged for contamination concerns. I reached out to Luzern to confirm that their products are tested for contamination, and was assured that this ingredient is free from contamination/chemical residue – with testing occurring not only when formulated, but also during batching and filling. For this reason, this product does not raise any major concerns. This product also contains echinacea extract - if you are allergic to products containing ragweed, mums, marigolds, or daisies, this product may cause irritation. As with any new product, conduct a patch test on the back of your forearm before applying to the face. 2) SERUM ABSOLUT Firming Collagen Booster: Marketed as “the ultimate youth-keeping serum”, this luxuriously light and fast-absorbing product glides onto the face and neck seamlessly while instantly lifting the skin. Stem cells, peptides, vitamins, and bio-Suisse extracts work symbiotically to maximize collagen production and boost epidermal nourishment. This serum is highly recommended as a supplementary product to enhance the results of nonsurgical cosmetic procedures (i.e. injections, laser treatments, chemical peels, etc.) due to the significant structural skin benefits it provides. Apply 2-3 pumps of this after using a toner before using other targeted treatment serums. For a brighter and more even skin tone, I recommend using this serum followed by the application of Luzern’s Serum Absolut Radiance. *Note: I do not recommend this product for users with acne-prone and/or very sensitive skin. This serum contains algae extract, which is wonderful for most skin types (especially dry and/or mature skin), however it is highly comedogenic – and can lead to breakouts in individuals who have chronic issues with acne. This product also contains potassium sorbate – a low-hazard preservative that may cause irritation in individuals with very sensitive skin. For individuals with acne-prone skin, this is still an incredible serum to use on the hands. The skin on the hands is highly prone to aging, and often goes unaddressed. This product can alternatively be used as a daily luxury hand serum, before applying a moisturizer and SPF. 3) FORCE DE VIE Crème Luxe: Living up to its name, this ultra-luxurious anti-aging cream restores moisture levels, boosts cellular energy, and amplifies nutrition utilization via a complex and sophisticated formulation crafted to deliver long-term age-defying results. This non-greasy brand best seller is larger than most luxury face moisturizers (containing 2.0 fluid ounces in contrast to the usual 1.7 ounces), and will last at least 3-4 months with daily usage. For best results, apply a small dollop to the face and neck after using Serum Absolute, but before applying Luzern’s mineral sunscreen and/or BB Crème. *Note: This moisturizer contains algae extract, which is wonderful for most skin types (especially dry and/or mature skin), however it is highly comedogenic – and can lead to breakouts in individuals who have acne-prone skin. It also contains cetyl alcohol – a fatty alcohol that is especially beneficial for dry and mature skin, however it is comedogenic, and thus not ideal for individuals with acne-prone skin either. Force De Vie Crème Luxe contains echinacea extract - if you are allergic to products containing ragweed, mums, marigolds, or daisies, this product may cause irritation. For individuals with acne prone skin, this product could alternatively be used as a rich hand moisturizer. 4) LA DEFENSE Urban Protect Day Lotion: Without the presence of artificial dyes or synthetic fragrances, this lightweight moisturizer is naturally yellow in color, and has a refreshingly pleasant peach-like aroma. La Defense Urban Protect Day Lotion hydrates and brightens the skin via organic camapu extract, L-arginine, stabilized vitamin C, hyaluronic acid, and panthenol. Ginsenosides (the major active pharmacological component of ginseng) and lutein protect the skin from absorbing environmental pollutants and blue-light induced free radicals. I apply 2-3 pumps of this to my face and neck after applying my serums. If you plan on going outdoors, follow up with Luzern’s Urban Protect Mineral Sunscreen. *Note: This product contains marigold extract - if you are allergic to products containing ragweed, echinacea, mums, or daisies, this product may cause irritation. This product also contains potassium sorbate – a low-hazard preservative that may cause irritation in individuals with very sensitive skin. As with any new product, conduct a patch test on the back of your forearm before applying to the face. 5) BIO-SUISSE Lip Enhancing Treatment: Formulated with oxygen, co-enzyme Q10, vitamin C, alpha lipoic acid, organic cold-processed oils, and plumping lipids, this revolutionary lip treatment actively enhances moisture levels, evens skin texture, reduces signs of aging, and protects against elements that visibly age the skin. For best results, apply in the AM and PM as a “lip serum” a few minutes before applying a lip balm, or heavier lip conditioner. This product works incredibly well as a lip primer before applying lipstick, and fits perfectly in a purse or jacket pocket without adding any significant bulk. *Note: 25% of proceeds from this product directly go to helping fight breast cancer. For professional makeup artists, I highly recommend using this routinely as a lip primer/lip conditioner on clients at least 20 minutes prior to applying any lip color – using disposable gloss applicators. 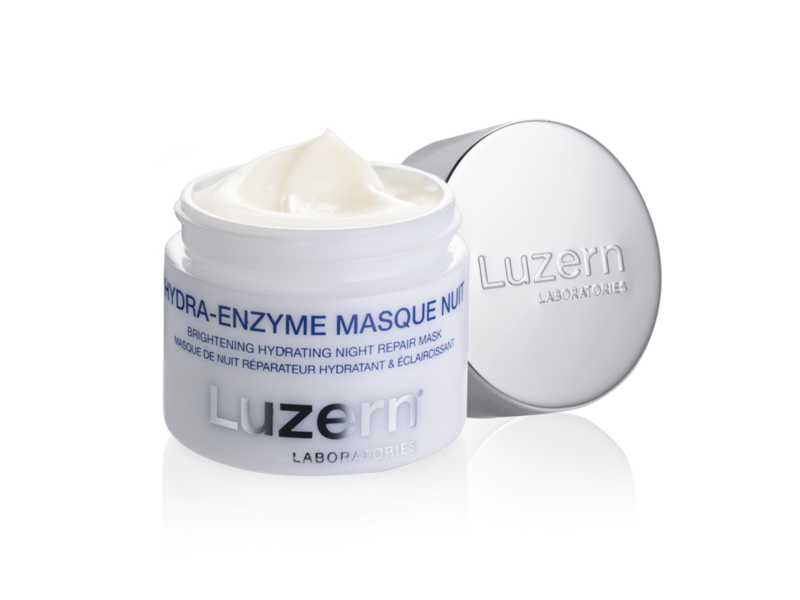 1) NUIT Hydra-Enzyme Masque: This 3-in-1 mask actively brightens, exfoliates, and hydrates the skin while you sleep. Pumpkin enzymes facilitate cellular turnover by gently breaking down the bonds that hold dead skin cells together in the upper levels of the epidermis – bringing newer, fresher, and more revitalized layers of the skin to the surface. This mask is mild enough to use 2-3 times/week without causing irritation or skin sensitivity. For best results, I recommend using an abrasive exfoliant/face scrub the morning after wearing this enzyme mask to physically remove the chemically broken down dead skin cells before applying a toner and serum regimen. *Note: This night mask contains cetyl alcohol – a fatty alcohol that is especially beneficial for dry and mature skin, however it is comedogenic, and thus not ideal for individuals with acne-prone skin. For acne-prone individuals, this product can alternatively be used as a luxurious overnight enzyme mask for the hands. This product also contains potassium sorbate – a preservative that may cause irritation in individuals with very sensitive skin. As mentioned previously, it is always essential to conduct a patch test on the back of your forearm before applying to the face. 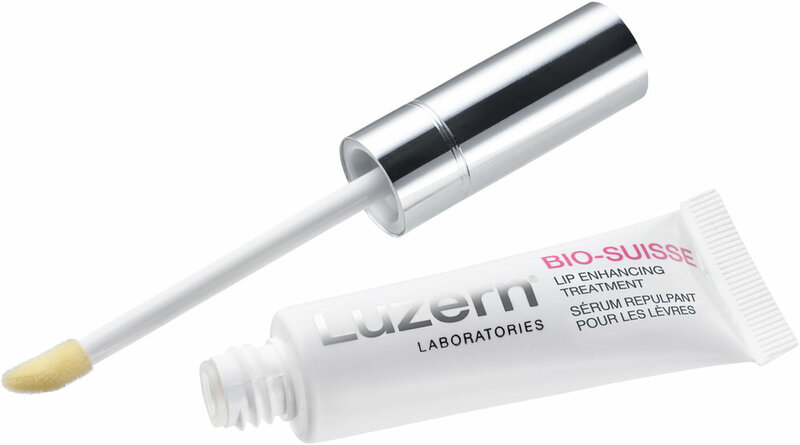 For more information on what makes Luzern stand out as an industry authority in clinically effective clean beauty with an extended shelf life, read more about the company here.